Sun 25 Nov HURRY UP PLEASE ITS TIME! Instagrammers assemble! Whether you are a beginner or a serious photography aficionado you can bring along your smartphone or camera and enjoy an afternoon capturing images of Coventry inspired by Journeys with ‘The Waste Land’ and its themes. The exhibition opens the following week and images from this Instameet will be on display within the museum. In celebration of the opening of Journeys with ‘The Waste Land’, Coventry Cathedral provides the spectacular setting for a performance of TS Eliot’s poem directed by Chris Stanley with actors Luke Beard and Imogen Parker. Join speaker Adrian Barlow for a talk offering an insight in to TS Eliot, his work and the context of his defining poem ‘The Waste Land’. Led by the performance poets Cecilia Knapp and Jemima Foxtrot, IOU tells the story of a woman’s life in an unforgettable journey through Coventry aboard a unique open-top bus. Beginning with a life-drawing class, Rear View reveals the town in new ways, with reflections, predictions and observations blurring the lines between reality and fiction. You are invited to come and Waste Time with What Lies Beyond…! Bring a poem, bring your painting, bring your knitting, bring an instrument: come and waste a little time and learn that no time is wasted. Come and do a turn or just turn up for the do. Taking your inspiration from Journeys with ‘The Waste Land’, join local urban sketchers for a day of drawing around Coventry City Centre. Look afresh at the cityscape, sketch in whatever medium you prefer and learn from each other in this self-led session. Please bring your own materials. FREE. To book, please contact Nick Brown at Nicholas.brown@warwick.ac.uk. Join us for an afternoon of poetry from some of the region’s foremost writers. The poems selected relate to themes within Eliot’s poem, particularly journeys and the spirit of human endurance. Featured poets include Matt Black, Nigel Hutchinson, Liz Jolly, Andrea Mbarushimana, Anthony Owen, and Naomi Shihab Nye. Through this specially selected programme of films, Coventry’s journey is traced: from its destruction in November 1940 to the present day. Films include J.B. Priestly’s The Heart of Britain, A City Reborn and Basil Spence, Building the Cathedral. As well as the city’s physical reconstruction, these films together illuminate the resilience and adaptability of the people of Coventry. 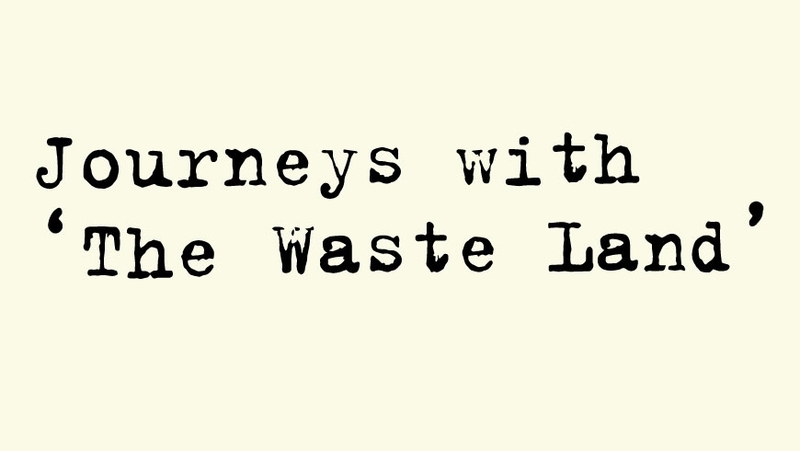 Come and meet Professor Mike Tooby, lead curator of Journeys with ‘The Waste Land’ and members of The Coventry Waste Land Research Group. For the past two years, this group has selected works for exhibition, written explanatory texts, designed the gallery lay-out and a programme of events. This is your opportunity to learn more about the making of this unique exhibition. HURRY UP PLEASE ITS TIME! Join us for the closing party. The evening will include poetry and a pub quiz. The Waste Land is widely seen as TS Eliot’s response to the devastations of the First World War. Susannah Heffernan, a writer of literary speculative fiction, takes inspiration from his characters, Madame Sosostris and the Phoenician Sailor, and tells the little known history of American soldiers in Europe during the Great War.For this event, Susannah Heffernan will read from her novel, a new work-in-progress, and there will be a Q&A session chaired by Professor Mike Tooby. This year’s LSA Annual Open Exhibition takes as its theme TS Eliot’s The Waste Land. The best work will be selected by a panel of judges including Professor Mike Tooby. Closing date for submissions: 1 Oct 2018. A musical exploration of The Waste Land. first of our Birmingham Conservatoire’s new VoxBox series, the essential role that music plays in this at times barren, at times deafening landscape is explored.